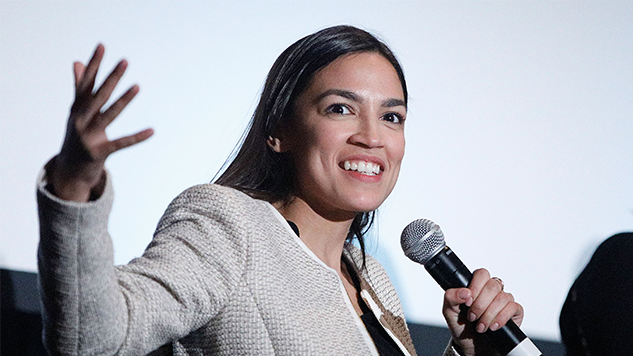 Last week, a video went viral of Rep. Alexandria Ocasio-Cortez (D-NY) offering up an impassioned rebuke to Senate Republicans for bringing her Green New Deal to a premature vote the day before. Something that got less attention, however, was the vote the environmental champion and the vast majority of her Democratic colleagues cast two days earlier. Ocasio-Cortez had been one of 224 House Democrats to back a bill that, if passed, would allocate roughly $580 million in federal funding over two years to public and private energy development projects in Europe and Eurasia, including natural gas infrastructure. Environmental groups hardly seemed to notice H.R. 1616. The Sierra Club told us it had not even taken an official position on the measure. But if passed into law, activists say the bill could solidify a decades-long transition to a natural gas energy future at a critical time for the environment. H.R. 1616 was introduced by Rep. Adam Kinzinger (R-AL) early last month. Disguised as a measure to crack Russia’s energy dominance in Europe and Eurasia, it passed the House easily on March 25 with a margin of 391-to-24 and no Democratic opposition—though 10 Democrats did not vote, including six members of the Congressional Progressive Caucus. The bill’s true intention, however, seems to be opening up new energy markets to American fossil fuel companies, enabling the easy export of liquid natural gas. In fact, it practically said so in its statement of policy. The middle provision is noteworthy in light of how strong the anti-fracking movement is in Europe. Thus far, four countries—France, Germany, Bulgaria, and Ireland—have banned the practice while the Netherlands has halted it until at earliest 2020. However, battles are still waging across the continent, which raises the question of what ‘enhancing’ the regulatory environment means. While it is true that H.R. 1616 could hurt fossil fuel-reliant Russia, activists Paste spoke to about the legislation had grave concerns about what its impact would be in terms of ending reliance on fossil fuels. Fox, whose critically-acclaimed 2010 documentary Gasland was nominated for the Oscar for Best Documentary Feature, has been fighting this fight for years and sees fossil fuels as inherently linked to tyranny around the world. In 2016, he even helped write the Democratic platform as a surrogate for Bernie Sanders, securing the inclusion of language pledging to disincentivize the development of natural gas power plants. To him, Democratic votes for H.R. 1616 represent a betrayal. Fox also pointed out that while natural gas is often billed as a cleaner-burning alternative to other forms of fossil fuels, some studies have found that it is actually worse for the environment overall because of the unintended consequences of the extraction process, fracking—like the leakage of methane, a more potent greenhouse gas than CO2. Texas-based environmental activist Sharon Wilson, who is widely known as Texas Sharon, shares Fox’s concerns. She was stunned to learn of the provisions of H.R. 1616. Wilson, a senior organizer with the group Earthworks, has been documenting fossil fuel pollution with infrared cameras in the industrialized Permian Basin for months in the hopes of forcing regulatory action. She told Paste that she has seen firsthand the rapid, unsafe expansion of natural gas exploration to meet the demand for exports. Today, ending the fossil fuel industry seems a long way off. While its dominance in the energy market may be declining, it has ties in Washington that run deep on both sides of the aisle. In fact, Democrats have for years been receptive to and pushed the dubious claims about natural gas being a cleaner-burning alternative to other forms of fossil fuels. And although the party has been moving left on environmental issues, even the ambitious Green New Deal notably does not contain a prohibition on new natural gas development. But calls for change are growing louder in response to increasingly troubling warnings from the scientific community. In October, the UN Intergovernmental Panel on Climate Change released a shocking report giving the world just 12 years to radically alter its energy consumption if global temperature increase is to be kept to 1.5°C relative to pre-industrial levels (it is currently 1°C warmer). Past that point, the report explained, the effects of climate change increase sharply in severity. Even a half-degree more could have remarkably profound consequences for all forms of life on earth. The Senate version of H.R. 1616 is currently in committee. It was introduced by Sen. Chris Murphy (D-CT), Sen. Ron Johnson (R-WI), Sen. Jeanne Shaheen (D-NH), Sen. Marco Rubio (R-FL), and Sen. Cory Gardner (R-CO).